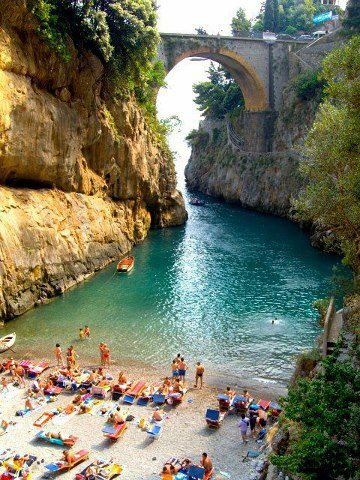 The Amalfi Coast is a stretch of coastline on the southern coast of the Sorrentine Peninsula in the Province of Salerno in Southern Italy. The Amalfi Coast is a popular tourist destination for the region and Italy as a whole, attracting thousands of tourists annually. During the 10th–11th centuries, the Duchy of Amalfi existed on the territory of the Amalfi Coast, centered in the town of Amalfi. The Amalfi coast was later controlled by the Principality of Salerno, until Amalfi was sacked by the Republic of Pisa in 1137. Since then the Amalfi coast has experienced a crisis. But after the unification of Italy the Amalfi coast has enjoyed a huge economic revival, prompted even by the international tourism. In 1997, the Amalfi Coast was listed as a UNESCO World Heritage Site as a cultural landscape.